Originally signed by the Cleveland Indians as an undrafted free agent on July 2, 2011...Signed by Ramon Peña, Koby Perez, and Domingo Toribio. 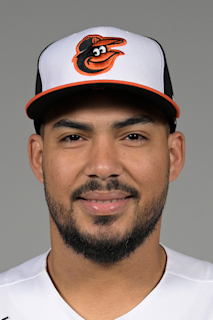 Hit his first Major League home run on 4/8 at NYY, a three-run homer off of RHP Domingo Germán...Recorded his first career outfield assist on 4/7 at NYY...Stole his first career base on 4/5 at NYY...Entered the season ranked as the Orioles No. 8 prospect, according to Baseball America and MLB Pipeline...Appeared in 72 games across three minor league levels; Short-Season A Aberdeen (seven games), Double-A Bowie (54 games), and Triple-A Norfolk (11 games)...Batted .249 (70-for-281) with 17 doubles, eight home runs, 35 runs, and 34 RBI in his 72 minor league games...Homered twice in his final three games of the season, recording four hits, 12 total bases, and four RBI in this stretch... Recorded his first career three double game on 8/17 at Connecticut. Made his Major League debut on 8/18 vs. LAA...Recorded his first Major League hit in the ninth inning of his debut...Recorded his first multi-hit game on 9/27 at PIT, going 3-4 with two doubles and one RBI...In 16 rehab games with Frederick and Bowie, batted .382 (21-for-55) with five doubles, five home runs, 13 runs, and 14 RBI...Reinstated from the 60-day DL on 6/14...Placed on the 10-day DL on 4/2 (retroactive to 3/30; strained right forearm)...Transferred to the 60-day DL on 6/14. Enters 2017 as the Orioles No. 9 prospect, according to Baseball America...Selected to Baseball America's High-A Minor League Classifcation All-Star Team...Played 128 games with Class A-Advanced Lynchburg...Named a Carolina League post-season All-Star...Named Player of the...Week for the period ending 7/17 after hitting .435 (10-for-23) with four home runs, nine RBI, and seven runs scored...Led the Carolina League in doubles (42) and extra-base hits (62), fnished second in runs scored (90) and total bases (247), third in home runs (20), RBI (95), hits (145), and slugging percentage (.494), and fourth in OBP (.368) and at-bats (500)...Had a season-long 12-game hitting streak, 6/30-7/13, hitting .354 (17-for-48) with six doubles, three home runs, 13 runs scored, and 12 RBI during that span...Homered and collected three hits in the opening game of the season on 4/7 vs. Winston-Salem...Tied a season-high with four hits, including three doubles on 8/25 vs. Wilmington...Drove in a season-high six runs on 7/16 vs. Wilmington, going 2-for-6 with two home runs, including a grand slam...Scored at least one run in 10 straight games, 8/16-25...Recorded 38 multi-hit games, including three four-hit games, and 10 three-hit games...Homered in back-to-back games four different times (4/7-8, 6/17-18, 7/5-6, and 7/16-17)...Batted .342 (38-for-111) with 10 doubles, nine home runs, 23 runs scored, and 29 RBI in 28 games during July...Hit .556 (5-for-9) with a home run and 16 RBI with the bases loaded. Began the season with Short-Season A Mahoning Valley and was promoted to Class-A Lake County after batting .419 (13-for-31) in his first eight games...Ranked second on the Captains in home runs with 10...Set single-season career highs in games played (72), runs scored (52), hits (82), doubles (22), home runs (13), and RBI (51). Missed part of the season due to a right elbow strain...Entered the season ranked as the 20 th-best prospect in the Indians organization by Baseball America. Entered the season ranked the 14 th-best prospect in the organization, according to Baseball America ...Missed time due to a right elbow injury. Finished eighth in the organization in batting (.305). March 17, 2019 Baltimore Orioles optioned LF Anthony Santander to Norfolk Tides. October 11, 2018 OF Anthony Santander assigned to Tigres de Aragua. October 2, 2018 Baltimore Orioles recalled LF Anthony Santander from Norfolk Tides. September 11, 2018 LF Anthony Santander assigned to Norfolk Tides. August 26, 2018 sent RF Anthony Santander on a rehab assignment to Aberdeen IronBirds. August 24, 2018 sent RF Anthony Santander on a rehab assignment to Norfolk Tides. August 15, 2018 sent RF Anthony Santander on a rehab assignment to Aberdeen IronBirds. July 24, 2018 Bowie Baysox placed RF Anthony Santander on the 7-day disabled list. May 13, 2018 Baltimore Orioles optioned RF Anthony Santander to Bowie Baysox. October 10, 2017 RF Anthony Santander assigned to Salt River Rafters. August 17, 2017 Anthony Santander roster status changed by Baltimore Orioles. August 14, 2017 Baltimore Orioles sent OF Anthony Santander on a rehab assignment to Frederick Keys. July 27, 2017 Baltimore Orioles sent OF Anthony Santander on a rehab assignment to Bowie Baysox. June 14, 2017 Baltimore Orioles transferred OF Anthony Santander from the 10-day disabled list to the 60-day disabled list. Strained right forearm. April 2, 2017 Baltimore Orioles placed OF Anthony Santander on the 10-day disabled list retroactive to March 30, 2017. Strained right forearm. December 8, 2016 Baltimore Orioles claimed OF Anthony Santander off waivers from Cleveland Indians. December 7, 2016 LF Anthony Santander roster status changed by Lynchburg Hillcats. April 5, 2016 LF Anthony Santander assigned to Lynchburg Hillcats from Lake County Captains. October 7, 2015 OF Anthony Santander assigned to Navegantes del Magallanes. June 28, 2015 OF Anthony Santander assigned to Lake County Captains from Mahoning Valley Scrappers. June 18, 2015 OF Anthony Santander assigned to Mahoning Valley Scrappers from Lake County Captains. April 10, 2015 Lake County Captains placed DH Anthony Santander on the 7-day disabled list. September 15, 2014 Lake County Captains activated DH Anthony Santander from the 7-day disabled list. September 9, 2013 Lake County Captains activated RF Anthony Santander from the 7-day disabled list. August 1, 2013 Lake County Captains placed LF Anthony Santander on the 7-day disabled list. April 29, 2013 LF Anthony Santander assigned to Lake County Captains from AZL Indians. June 20, 2012 Anthony Santander assigned to AZL Indians. July 2, 2011 Cleveland Indians signed free agent OF Anthony Santander to a minor league contract.